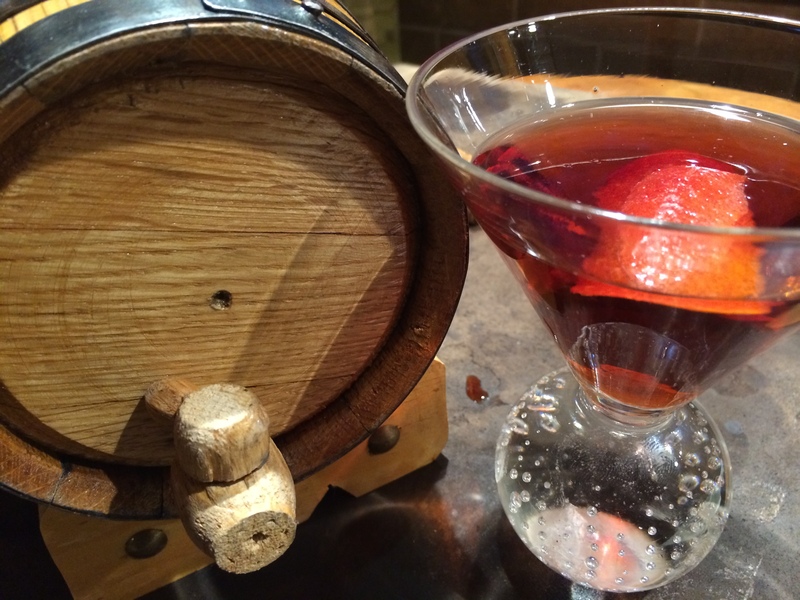 It’s Negroni week! And an aged Negroni is even better. Used to be that only the big distilleries were able to age their finest spirits in charred oak barrels. 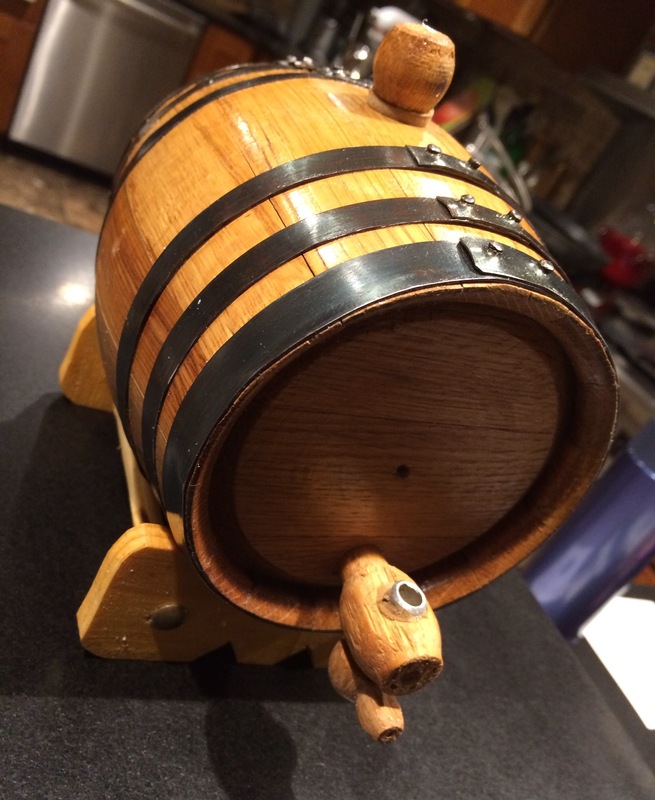 But now, there’s a movement goin’ on…and hand-crafted oak barrels are available to aficionados at home. Companies like Redhead Barrels (http://www.redheadoakbarrels.com) are offering oak barrels for aging that range in size from 1 liter to 20 liters. And that’s where this enthusiast comes in: with a 1-liter barrel, I’m able to age my favorite spirit–vodka, rum, whiskey, bourbon, anything–in just a few weeks, elevating the flavors to levels previously unknown. My 1-liter barrel arrived with the spigot and bung separately. Curing the barrel is necessary before using it. You do this by rinsing the barrel out a few times to remove any loose pieces of wood chips or splinters that may still be inside. Hand-turn the spigot into the barrel until it fits snugly and place the barrel in the sink on the included stand. Fill the barrel with very hot water…and watch. Some barrels are totally watertight and will not leak. Others may take literally a few days of repeated fillings with hot water before it thoroughly seeps into the wood, expanding it to seal the barrel. Once there are no leaks, it’s ready to go. Empty the water out of the barrel and fill it with your favorite spirit. Because there is more wood surface area to less liquid (as compared to the large barrels companies like Jack Daniels use), your alcohol will age faster…in weeks instead of years. Once you’ve aged it as much as you want, you simply pour it into a bottle to stop the aging process. Rinse the barrel out thoroughly, and you are ready to age yet another spirit. I chose to age a cocktail that I first savored at the Greenhouse Tavern in Cleveland, Ohio, the brainchild of talented chef Jonathon Sawyer. The call it a Negroski, their take on a Negroni. It features equal parts Campari, Cocchi sweet vermouth, and OYO stone fruit vodka. They make large batches of it and keep it in a barrel until they serve it. So enamoured my wife and I were with this drink, that I begged the bartender to give me the recipe. Doing the math, equal parts of each ingredient meant 1 1/3 cups of each to make a quart…which fit perfectly in my 1-liter barrel. Once I corked the top with the bung, it was time to let it age. A slight daily rotation of the barrel gently rocks the liquid inside, exposing it to the barrel’s charred wood interior, giving it more flavor. And at the end of a week, I was ready for my first tasting: the wood had a subtle influence, rounding out the flavors. I wanted a little more, so I waited another week. : even better, but not quite there. It took a total of three weeks before the drink reached its flavorful peak. I poured some of the drink into a cocktail shaker with ice, stirred briskly with a spoon, and strained it into a martini glass, garnishing with a twist of blood orange peel. Delicious! Just recently, I purchased a 3-liter barrel. After all, 3 times the booze means 3 times the fun!